Watercolor self-portrait by Thomas Buford Meteyard, one of the few images from the Athenaeum show that can be found online. From now through February 18, 2018, the Boston Athenaeum is hosting what may be the largest ever exhibition of work by visual artist Thomas Buford Meteyard. Meteyard was a member of the Visionists who created beautiful illustrations for Copeland & Day publications such as the “Vagabondia” poetry series written by his good friends Bliss Carman and Richard Hovey. He was also part of a group of young American artists who journeyed to France to learn the secrets of Impressionism from Monet and his circle. Both groups of friends hung out at the beach house in Scituate, MA where Meteyard lived with his mom. 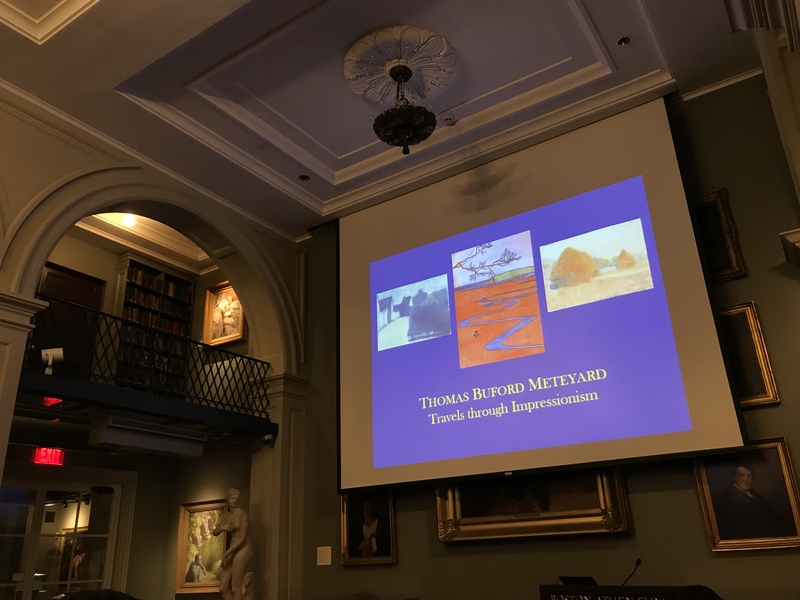 The show contained pieces lent by Meteyard’s descendants, who now live in the UK, as well as several pieces recently donated to the Athenaeum by Boston-based writer and art dealer Nicholas Kilmer. The majority of the pieces do not exist online and are difficult to find in books, and photography is not allowed in the gallery, so make sure you catch the show before February as you may not get another chance to see them all. I attended the opening, which drew a surprisingly large crowd, and featured a talk by the curator David B. Dearinger. This was my first time visiting the Athenaeum, which is a members-only library, but is open to the public for events such as exhibit openings. The entire ground floor was open for the event, and the chance to see the inside of the building and its permanent collection of sculptures and paintings was as exciting as the show itself. I was most excited to see Meteyard’s drawings and prints, but the highlights of the show were his Impressionist paintings. Seeing them in person, from various distances, and appreciating the way the abstract brush strokes and seemingly odd combinations of color somehow resolve into a very natural-feeling image, is a much different experience than viewing them online or in a book. More info on the show and other Athenaeum events can be found here: http://www.bostonathenaeum.org/exhibitions/current-exhibition . Curator David Dearinger’s presentation at the opening of the Meteyard Show. 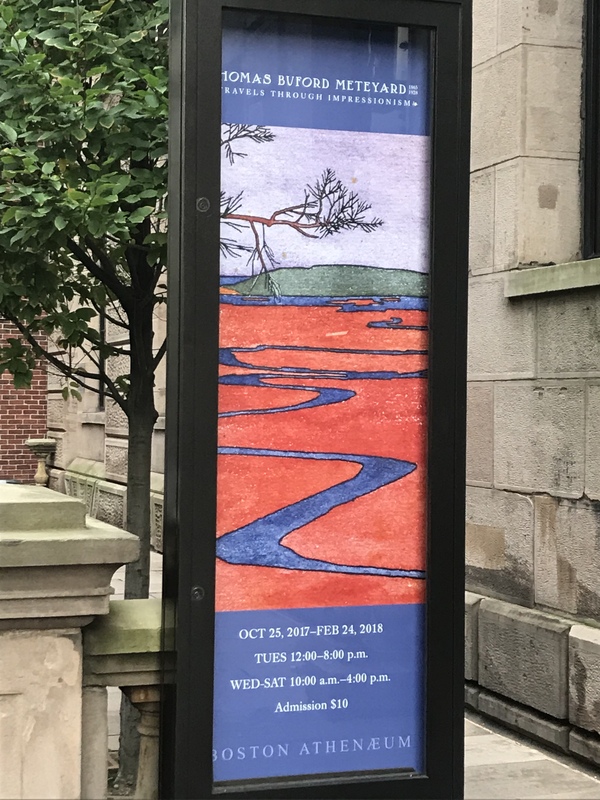 Sign for the Meteyard show outside the Boston Athenaeum. 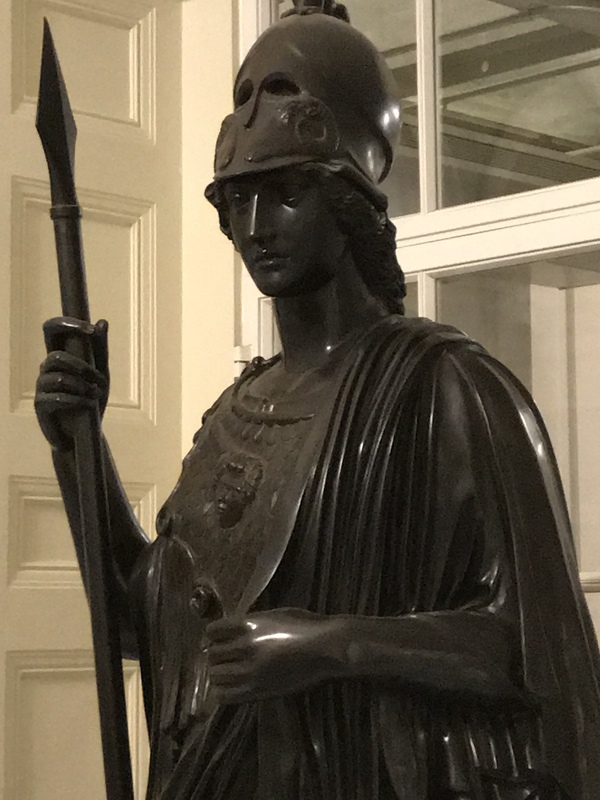 Statue of Athena at the Boston Athenaeum. 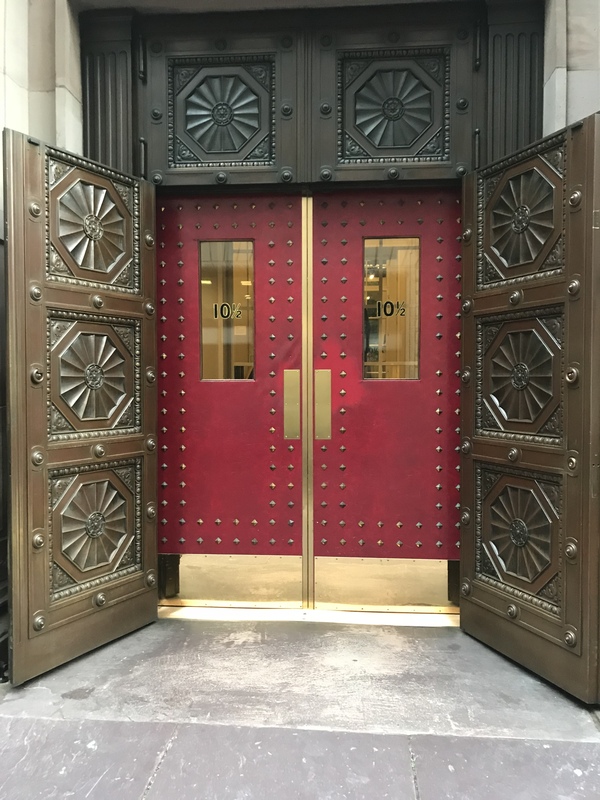 Entrance to the Boston Athenaeum.